This book argues that neuroscience, evolutionary psychology, and behavioral economics often function as a political ideology masquerading as a new science. In looking at works by Antonio Damasio, Steven Pinker, Richard Thaler, Cas Sunstein, and John Tooby, Robert Samuels undertakes a close reading of the new brain sciences, and by turning to the works of Freud and Lacan, offers a counter-discourse to these new emerging sciences. He argues that an unintentional political manipulation of scientific thinking serves to repress the psychoanalytic conception of the unconscious and sexuality as it reinforces neoliberalism and promotes the drugging of discontent. 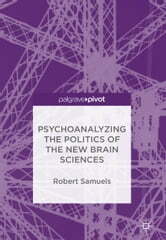 This innovative book is intended for those interested in science, psychoanalysis, and politics and offers a new definition of neoliberal subjectivity.